Have you ever told yourself you were going to become a praying mom? And then by day 15 (or 7…or, let’s be real…day 2!) you’ve already fallen off the horse? We get how frustrating that can be. As believers, we know we should be praying, and when our sincere efforts to make that happen on a regular basis fall through we can be left feeling guilty, and even like we’re bad Christians. We believe prayer is one of the most important, but most overlooked parts of Christian parenting today. 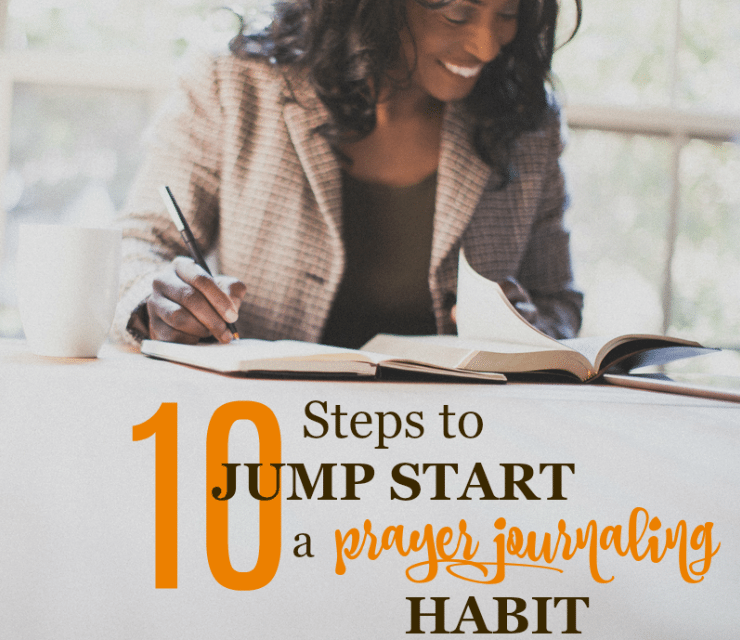 If you feel the same way, and are tired of constantly trying and failing at this vital part of parenting, try these ten steps to jump start your habit! 1. Don’t turn your phone on first. Unless you’re using an app to help you pray (which we don’t necessarily recommend), choose to leave your phone face down while you’re spending time in prayer. There are simply too many notifications, bells, and whistles that will take your attention away from where it needs to be. 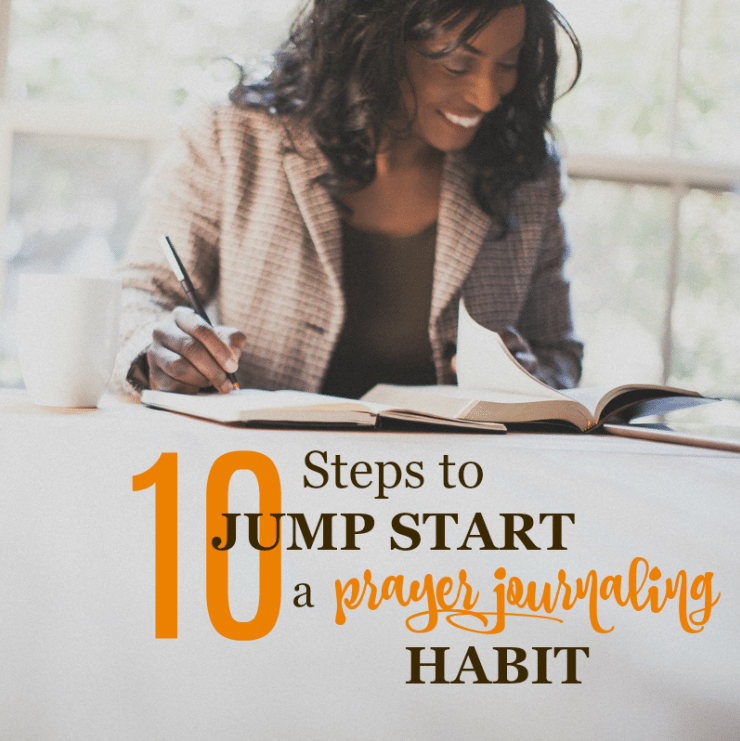 Not doing this is the #1 obstacle you’ll face to making prayer a priority in your home. The #1 obstacle you’ll face to making prayer a priority in your home is your phone. Don’t turn it on first. 2. Identify and drop ineffective habits. What have you tried before that isn’t working? Let it go and start over fresh with a new perspective. If getting up at 4AM to pray sets you up for failure, choose to drop it as ineffective and do something else. If planning to pray at your child’s baseball practice each day keeps getting interrupted by moms who want to talk, choose another time. Don’t hang on to things just because you really want them to work, or because they worked in your head. If they’re aren’t working, let them go. One of our BoyRaiser Tribe members addressed this when she said, “This is like having godly girlfriends on a 24 hour hotline.” If you need help knowing what actually does work, the Tribe might be the right place for you. 3. Create an experience you’ll look forward to each day. I’m a creature of habit. I pray in the same chair at the same time most every day. I also love to associate my prayer times with certain smells that make me feel uplifted, engaged, and ready to dive in. I have a favorite verse on my end table that freshens my mind and heart before starting each day, and the view out of my front windows in absolutely stunning. All of these things together are pleasing to my senses. The more I make them a part of my habit of prayer, the more I’ll associate those things positively with spending time with my Father (think Pavlov’s dogs!). Pick what works for you (soft music?) and do it over and over again! 4. Set up visual or tactile reminders. When I first started trying to incorporate prayer into my daily life, I didn’t have a smartphone (yes, I’ve just dated myself). I took a few minutes each day to write out my prayers on an index card or sticky note and placed them strategically around my home so that when I entered key places throughout the day I would have a visual reminder to pray. Now, I tend to set alarms on my phone to remind me to pray for specific things or people. I wear an iWatch, so even if I’m not in the same room with my phone I still get a reminder to pray. 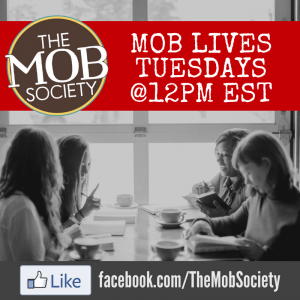 One of my very favorite visuals to use each morning before I drop my kids off at school are the weekday prayers we provide on the MOB Society Facebook page. The last thing my boys hear before they leave my presence for the day is mama’s voice praying the Word of God over their hearts. Tribe members can also get these prayers as a full calendar month print out. 5. Brain dump each day before praying. This has been one of THE BEST things I’ve done to increase my chances of actually praying on any given day. I have a terrible time concentrating on prayer when I know there are other things that need my attention. I’m embarrassed to share that, but it’s true! Taking a moment to make a list of the pressing to-dos of my day BEFORE I start to pray clears my mind and helps me go deeper without as much distraction. 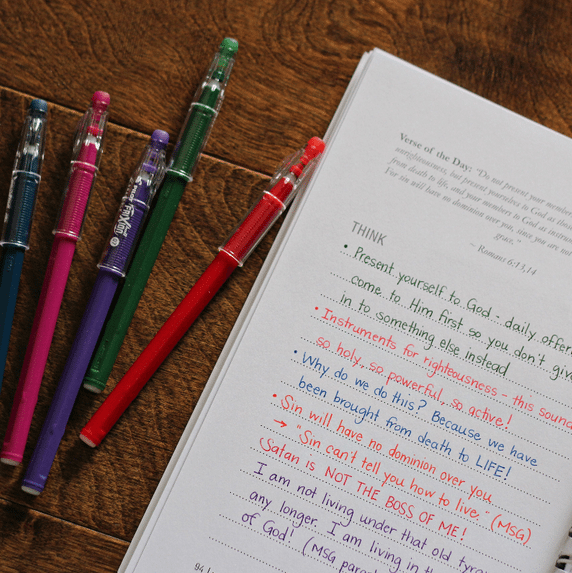 We recently updated the Book of Prayer (“BOP” – a physical prayer journal we offer once every quarter) to include this “brain dump” feature before every day’s prayer and our BOP owners have absolutely loved it! Can we say something that might seem harsh (based on the fact that we believe you’re totally able to handle the truth)? Being a Christian and prayer go hand-n-hand. If you have been trying to create a habit of prayer, but haven’t been able to, spend some time looking at your priorities with fresh eyes. We will always do the things we feel are most important. If prayer doesn’t top your list in a practical, “I’m doing this!” kind of way, ask God to show you how to make it a higher priority! 7. Enlist an accountability partner. Dalyn, a member of our Tribe membership program said this, “People living out the Christian walk are the minority. It’s easy to get on social media and be overwhelmed with this week’s ‘movement’ or others’ political or religious beliefs. Everyone is always soapboxing…” and she’s right. Surround yourself with people who will point you back to the truth of God’s Word over anything different the culture might try to tell you. Having someone, or a group of like-minded moms…like those inside of the Tribe, to walk with as you try to create a new habit can make all the difference. Surround yourself with people who will point you back to the truth of God’s Word over anything different the culture might try to tell you. 8. Give yourself permission to say “No” to some of the opportunities that come your way. Even good opportunities can take you further from your goals if you let them. But how do you know what to say “no” to? Living in deep relationship with God presents us with an amazing cycle if we’ll let it. The more we pray and read His word (building a strong relationship and foundation) they more we’ll know Him, think like Him, and make decisions based upon what we know to be true. It will become easier to know what you are and are NOT called to put your hands to the closer you are to God! 9. Keep it simple when you need to. When I’m using our Book of Prayer—which takes just one small verse or passage and uses it to craft a prayer for the day—I like to read the whole chapter of the book of the Bible it comes from and reflect on the larger picture. BUT, I don’t always have time to do that. When I need to, I know that praying that one simple verse can and will make a difference in lives—mine and my families’. 10. Give yourself grace and keep starting over. As with any new habit, it takes time to have lots of wins. If you fail, pick yourself back up and try again. Get back on the horse. Jump into the deep end. Go for broke. Use whatever saying you need to (that means exactly the same thing!) to motivate your heart, but remember that we serve the God of second (and third, and fourth, and fifth…….) chances. It is never too late to start again. 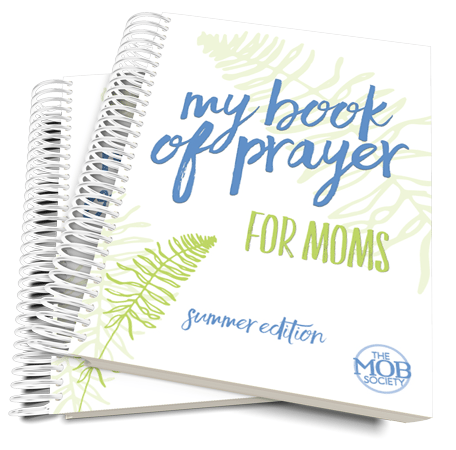 My Book of Prayer is our quarterly prayer journal that helps you make prayer a practical priority! Designed to take you through 90 days of prayer, My Book of Prayer gives you a quarter of a year of prayerfully, carefully curated prayers so that you see the hand of God clearly in the various seasons of your family’s life. Planning prayer quarterly also allows our team to add special touches, like praying through themes of new life, new beginnings, and growth over the Summer months (yours in the latest Edition!). “I have always had a difficult time studying the bible and being consistent with my studies. My Book of Prayer is the answer to my prayers. Pre-orders for the Summer Edition of My Book of Prayer are open now through May 7, 2018! As a small ministry, we must order an almost exact amount of copies that we need. We simply can’t afford to house lots of extra copies, so we make a new edition of My Book of Prayer available each quarter (Summer, Fall, Winter, and Spring) and place an order for the amount of copies we need. The hard deadline for the Summer edition is May 7th, so please act quickly! 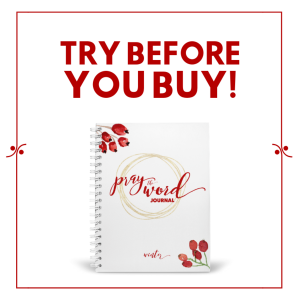 To learn more about pre-ordering your copy of My Book of Prayer, click here!